I've had a score to settle with Swiss Meringue Buttercream icing since promising to post about it several times...since forever!!! SMB, as it's known in the cake world, is also the 'problem child' of frostings/icings and can cause much heartache to the amateur cake decorator, such as I am. But if I can do it, then so can you! A bit blurry, but I was so proud! My first source of SMB knowledge came at the same time as my introduction to the amazing inspiration that is Sweetapolita. 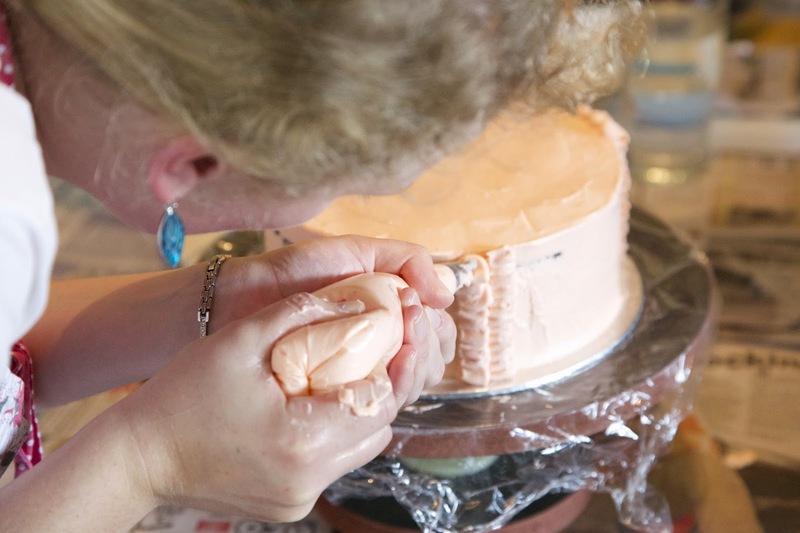 Rosie's SMB Demystified post clears up most queries and encourages the most tremulous baker to have a go at making SMB. It is her recipe for SMB that I have adapted in this post and her photo diary along with her instructions are a great resource to look at while you make it for the first few times. I'm simply providing it here in the form that I use for clarity's sake. Martha Stewart's recipe is often recommended to cakers, but I prefer Rosie's because it uses less butter but still works perfectly. Personally I think the 'secret to success' for this icing lies in the butter: it needs to be nearly room temperature but not soft. A helpful test is that you should be able to leave imprints in it when pressing the butter with your fingers without it 'walling up' or bending the rest of the block or stick (see the second image in this clever blog post by Sonia of Nasi Lemak Lover to demonstrate the right butter consistency!). The difference between butter that is too soft or just right, is a tense half hour spent hovering over the mixer praying that it 'comes together', or ferrying small amounts to the microwave for short blasts then returning them to the mixing bowl and doing more hovering... More on how to fix the inevitable problems later! Why bother, then, with such a temperamental icing-child? 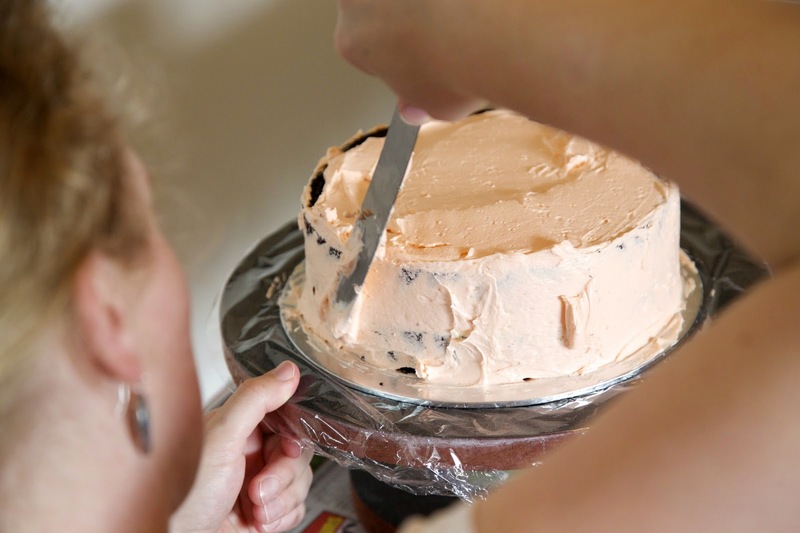 It is hands-down the most useful buttercream that I've used for piping. 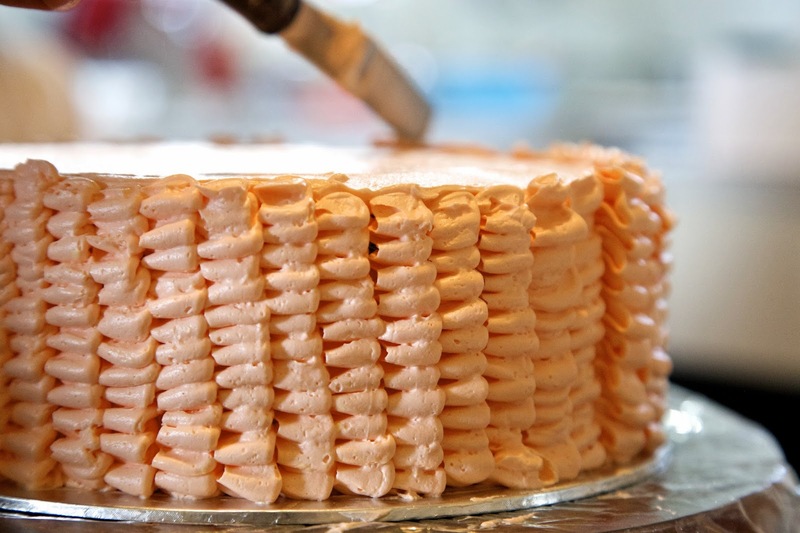 It holds up well (although is not ideal for the heat of summer), tastes rich without being overly sweet, and it can provide a bubble-free, silky smooth texture like no other frosting! Although I'm stingy with using egg whites, it's worth following the recipe exactly to get the right consistency of icing. Adapted from Sweetapolita. 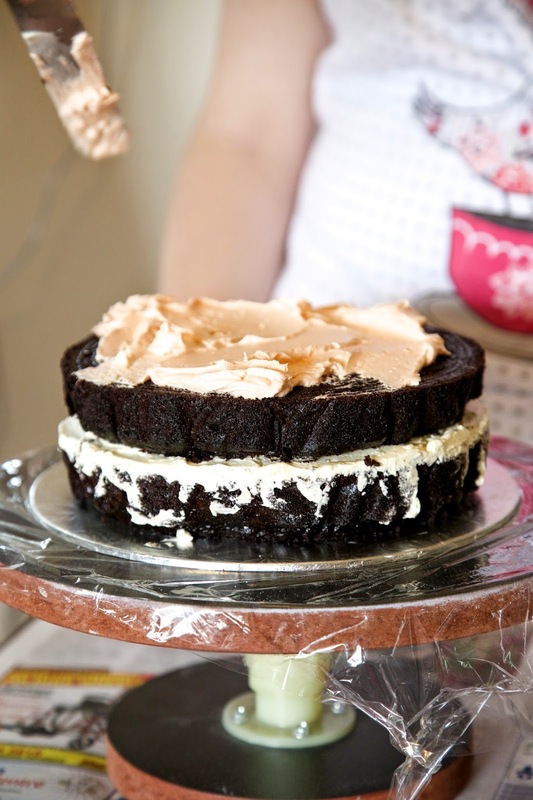 Makes enough to cover (crumb coat and decorate with rosettes/frills) a two-layer, 9-inch cake. First de-grease the bowl and whisk attachment of a stand mixer using lemon juice or white vinegar. Rinse, and wipe clean with a paper towel (this protects the egg whites from any fat that will prevent them from whipping). In the mixing bowl (or other heatproof bowl) place the egg whites and sugar. Place the bowl over a pot of simmering water - make sure the bottom of the bowl is not touching the water surface. Whisk the egg and sugar mixture continuously while heating until the sugar has dissolved and the egg whites are hot - this might take ten minutes or longer. You can check by (swiftly) running your finger along the bottom of the bowl and feeling for any grits of sugar that aren't dissolved. Don't get burnt though! Remove the mixing bowl from the heat and place in the stand mixer (if you have used a bowl other than your stand mixer bowl to heat the egg whites, transfer the mixer to your stand mixer bowl). 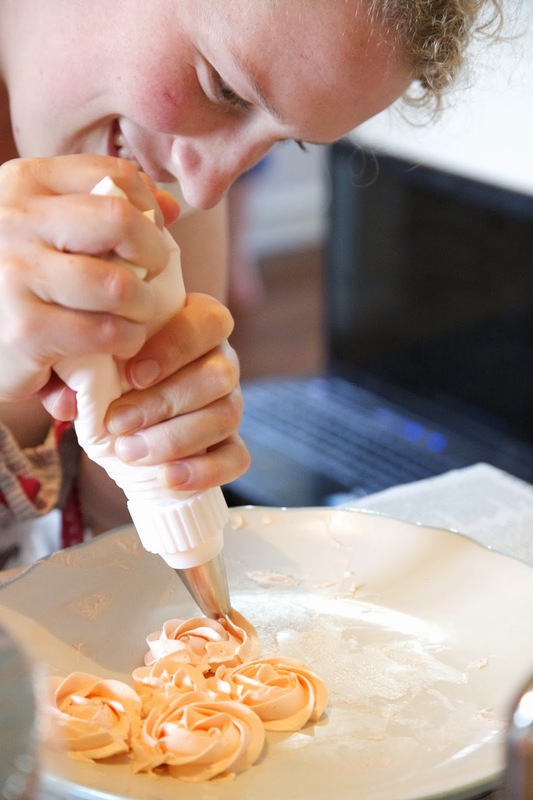 Using the whisk attachment, whip up the egg and sugar mixture until it is a thick, glossy meringue that forms stiff peaks when the whisk is removed; this takes about ten minutes or so of whipping. IMPORTANT: Is the bowl still hot? It must be cold or at least neutral to touch before adding butter in the next step, otherwise the butter will melt. You can choose to place the bowl with meringue in it in the fridge for ten to fifteen minutes to cool it down. Perfectly whipped and ready to get all buttered up! 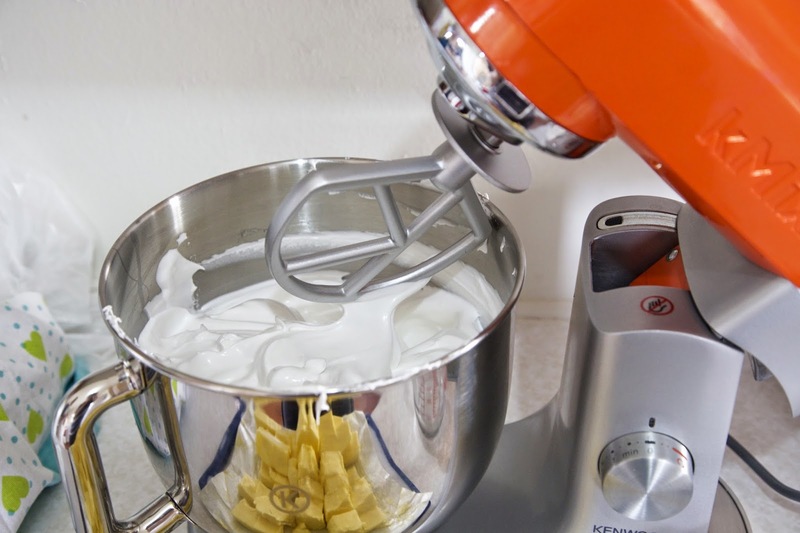 Change to a paddle attachment on your stand mixer (if you have Kenwood mixer, your K-paddle is perfect). With the mixer on low speed, slooooowly (i.e. at intervals of 30 seconds or longer) add the butter a couple of cubes at a time. The meringue mixture will deflate, like in the image below. Et voilà, it might look like a mess, but this batch has come together beautifully! Lastly add the vanilla or other preferred flavouring and food colouring if desired, beating on low speed until mixed through. This icing freezes and de-frosts really well, just whip it back into shape after thawing. Help! My SMB is runny like yoghurt! Several possibilities: the egg whites weren't whipped to stiff peaks or they were still warm when the butter was added, or the butter was too soft. Either way, refrigerate the mixing bowl for at least 20 minutes and then beat again for five minutes. Repeat this 20/5 pattern until the mixture starts to offer some resistance to the beating and thickens a bit. Add the rest of your butter when this starts to happen. Help! My SMB seems to have curdled and taken on the texture of cottage cheese! It's likely that your butter was too cold/solid - or too warm! - when you added it. You could try refrigerating then whipping as per the previous advice, or you could nuke it into submission! 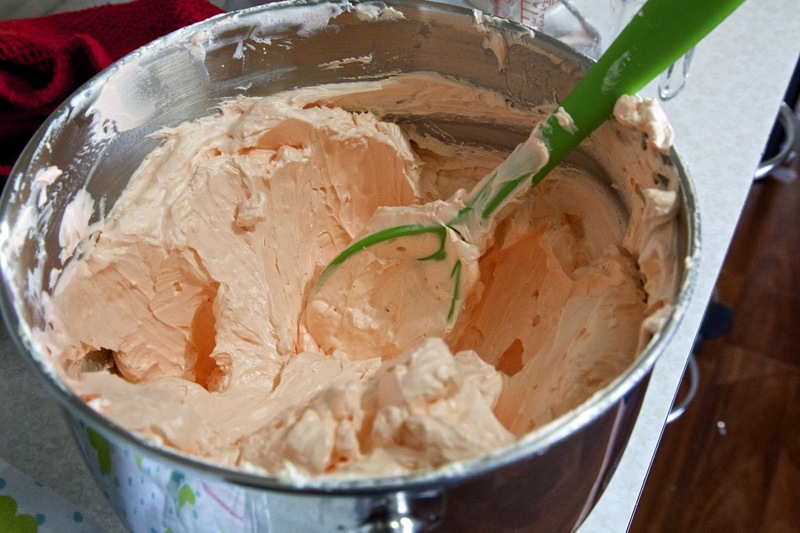 Remove approximately one fifth of the icing from the mixing bowl and place in a microwave-safe container. Nuke it for approximately 15 seconds, stir, and gradually add this back into the main mixing bowl while beating. Keep beating for five minutes more and if it doesn't make a difference repeat the process. This has happened to me several times, and often it takes two goes of nuking and straining back in, but it always works! Remember: keep breathing and keep mixing!!! For more excellent advice see Sweetapolita's original posts here and here. 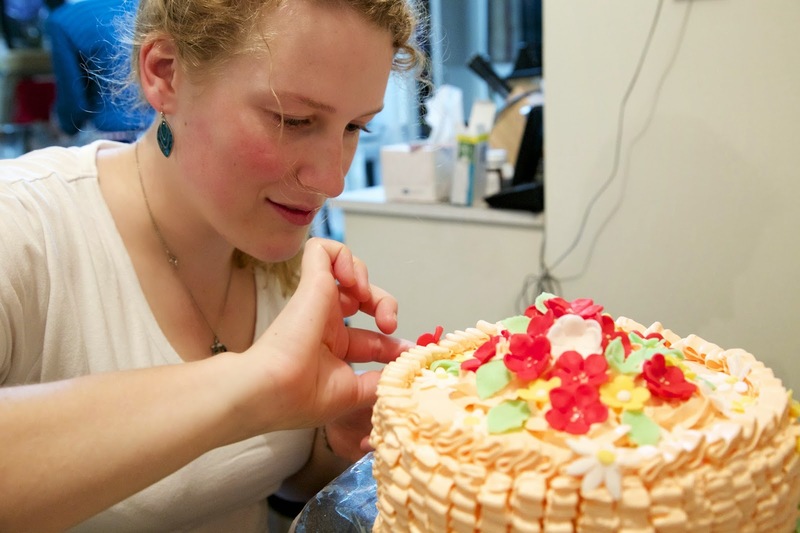 The following is the photo diary of a frilly and floral SMB cake. Previously I've posted how we made the gorgeous fondant decorations, so here I'm showing how we put it all together and piped the SMB frills into place. 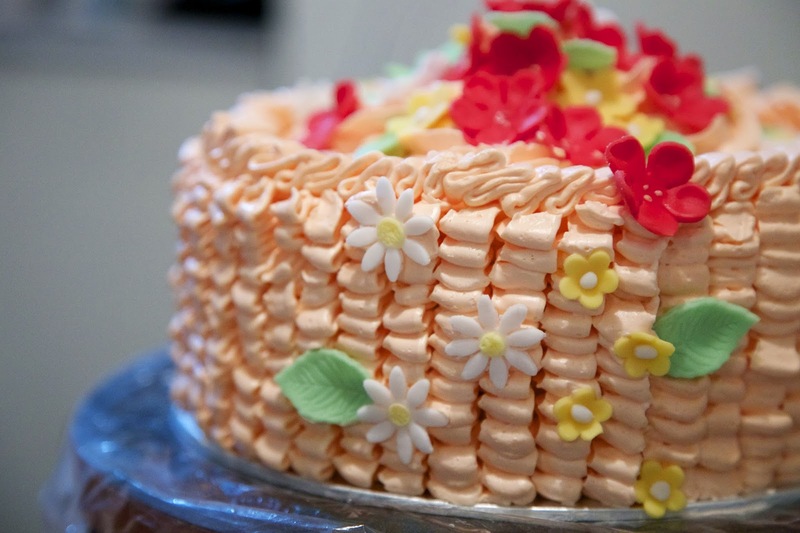 To create the vertical frills, we used a Wilton #104 tip, also known as the petal tip. It is shaped like a tear-drop, and when used it's important to keep the fat end pointing up/away from you, while the narrow end is down/nearest to you. 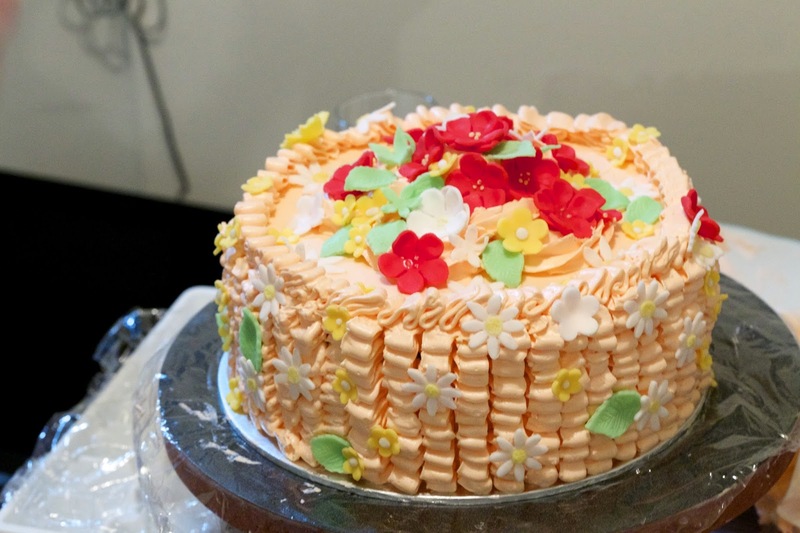 Frills are pretty much an in-out, bottom-to-top motion, coming out approximately a centimetre from the cake which was the extra width of our cake board. 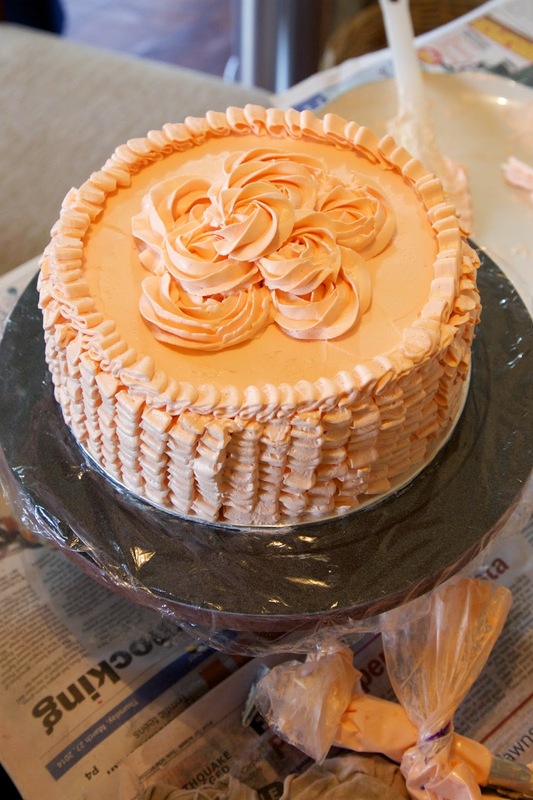 Frill direction (along the side of the cake, like in Sweetapolita's post, or into it like ours) is up to the decorator! For the cake itself I prepared one quantity of the recipe for Sweetapolita's easy and delicious Chocolate Celebration Cake that I re-blogged in this post. 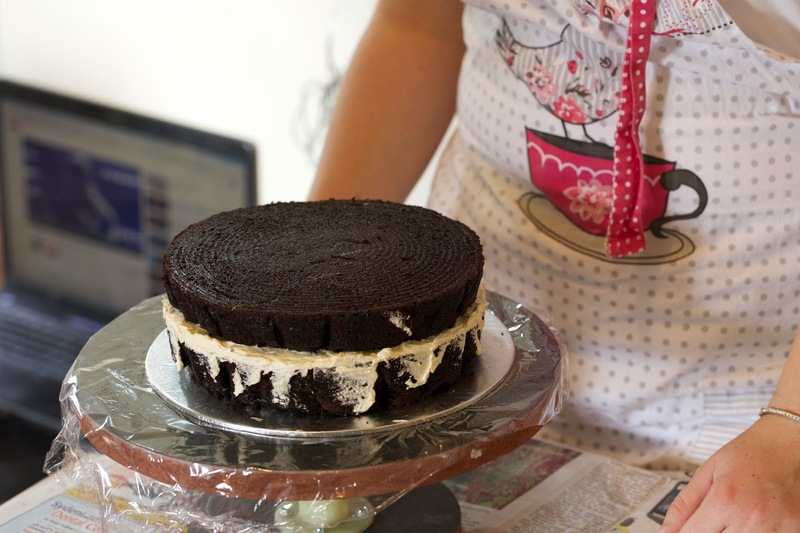 It made two decent 9 inch-diameter layers with which my friend D showed superb new skills at assembling and crumb-coating with a regular buttercream (recipe from same post as the cake). Rosette practice: use a plate so you can have a go then scrape off after each attempt and try again!